"The Indian has reached the end of an era. The things that we hold sacred, the things that we believe in have been repudiated by the federal government. But we will not be silenced again, left behind to be absorbed conveniently into the wretched fringes of a society that institutionalizes wretchedness. The Buckskin Curtain is coming down." These words, written by Dr. Harold Cardinal in 1969, helped set the tone and direction for the relationship between Canada's Aboriginal people and the federal government for years to come. They appear in the concluding chapter of Cardinal's book, “The Unjust Society: The Tragedy of Canada's Indians”. It was written in response to the government's White Paper on federal Indian policy, and then-Prime Minister Pierre Elliot Trudeau's promises for a “just society” for all Canadians. “The history of Canada is a shameful chronicle of the white man’s disinterest, his deliberate trampling of Indian rights and his repeated betrayal of our trust. Generations of Indians have grown up behind a buckskin curtain of indifference, ignorance and, all too often, plain bigotry. “Now, at a time when our fellow Canadians consider the promise of a Just Society, once more the Indians are betrayed by a programme which offers nothing better than cultural genocide." The White Paper, produced by then minister of Indian Affairs Jean Chretien, proposed elimination of the department and of the Indian Act and, with it, elimination of any special status for Aboriginal people. Cardinal called the proposed policy changes outlined in the White Paper a "thinly disguised programme of extermination through assimilation." Cardinal was born in High Prairie, Alta. on Jan. 27, 1945 and grew up on the Sucker Creek Cree First Nation in northern Alberta. He was barely out of his teen years when he first entered the world of Indian politics. In 1968, at the age of 23, he was elected president of the Indian Association of Alberta (IAA), the youngest person ever to hold the position. He would go on to serve as president of the provincial organization for eight more terms. Cardinal was thrust onto the national stage in 1969 when, while at the helm of the IAA, he wrote “The Unjust Society”, which has been called one of the most important books ever published. In it he called for changes in government policy that would allow Aboriginal people to become full participants in Canadian society without having to give up their culture or treaty rights. Cardinal continued his literary attack on government policy and in defense of Aboriginal rights. In 1970, he helped produce “Citizens Plus”, which became known as “The Red Paper” for its focus on countering the contents of the Trudeau government's White Paper. Cardinal was not alone in his opposition to the changes being proposed by the government in Ottawa. With widespread opposition among Aboriginal leaders to the White Paper, the document was shelved in 1971. Cardinal's written works, and his unwavering battle to bring about change in the way the federal government dealt with Aboriginal Canadians, were catalysts for shifts in government policy, but he left his mark in other ways as well. While president of the IAA, Cardinal helped to form the National Indian Brotherhood, which has since become the Assembly of First Nations. In 1977, Cardinal wrote another book, “The Rebirth of Canadian Indians” which, like his previous works, took the federal government to task over its treatment of Aboriginal people. That same year, he became the first Aboriginal person to hold the position of regional director general of Indian Affairs in Alberta. Cardinal would go face to face with the feds again in 1982 when he joined other leaders who fought to get Aboriginal people a seat at the table during constitutional negotiations, and to ensure the final document would include protection of Aboriginal rights. 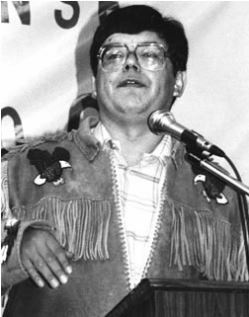 He served as chief of Sucker Creek Cree Nation from 1982 to 1983 and in 1983 was appointed as vice-chief of the AFN for the Prairie region. Cardinal often spoke of the important role education must play in improving the lives of Aboriginal people in Canada, and in his own life provided others with an example of what could be accomplished. He graduated from the Native Law program at the University of Saskatchewan in 1991 and completed his LLM at Harvard University. He was called to the bar in November 2004. On June 2, 2005, he learned that he had earned his doctorate of laws from the University of British Columbia for his studies of the inter-relationships between Cree law and Canadian law. Cardinal received an honorary doctor of laws degree from the University of Alberta in 1999. He worked as an assistant professor at the University of Saskatchewan and was also Indigenous Scholar in Residence at the University of Alberta's faculty of law. In 2000, Cardinal penned his last book, this one with co-author Walter Hildebrandt. “Treaty Elders of Saskatchewan: Our Dream is That Our Peoples Will One Day Be Clearly Recognized as Nations” looked at the treaty relationship in Saskatchewan from the perspective of Elders from across the province. That same year, Cardinal made an unsuccessful foray into federal politics. He ran in the federal election in the Athabasca riding, under the Liberal banner and under the leadership of his old foe, Jean Chretien, but failed to win the seat, losing to incumbent Dave Chatters of the Canadian Alliance party. In 2001, Cardinal's many accomplishments were recognized by the National Aboriginal Achievement Foundation, when he received the award for Lifetime Achievement at the National Aboriginal Achievement Awards ceremony in Edmonton. Many of today's most influential Aboriginal leaders have fond memories of Cardinal and stories of how his words and deeds inspired them. On June 3, at the age of 60, Cardinal died of lung cancer. A special tribute to the well-known and well-respected author, teacher, lawyer and leader was held in Edmonton on June 4. The event, organized by the Assembly of First Nations, the Native Women's Association of Canada and Native Counselling Services of Alberta, was to be a chance for those touched by Cardinal to gather and honor the man one more time. After his death, it became a memorial to the man who had so often stood up straight and strong, always ready to use words and wit and determination to protect the rights of Aboriginal people.